Happy Friday, friends, and cheers to the weekend!! 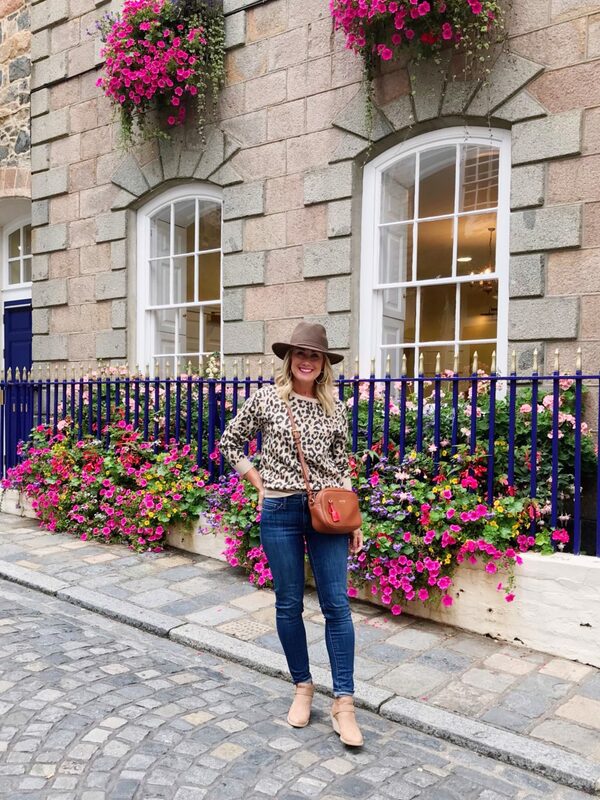 Yesterday was our first stop on the British Isles trip, and we wandered around the charming island village of Guernsey. Apparently there’s a best-selling book based there, The Guernsey Literary and Potato Peel Pie Society, and from your comments on my social media, it’s a must-read! 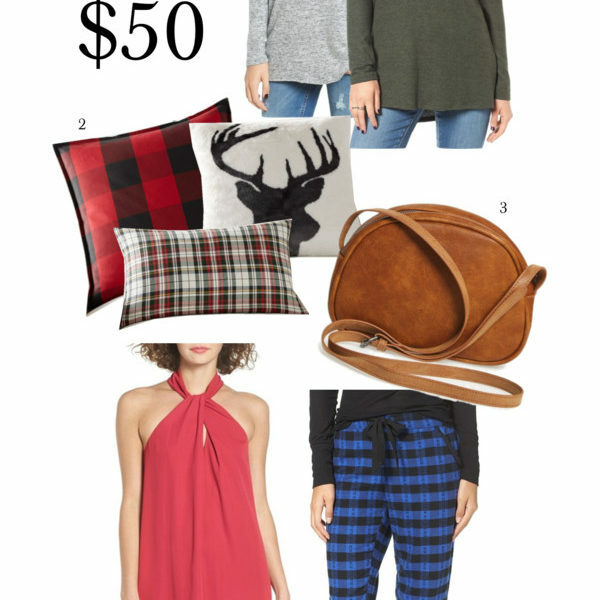 Today I’m sharing a new Faves Under $50…and it’s a good one, if I do say so myself! These are many of the pieces I packed for our trip, and great for transitioning to Fall. one // Pullover with Striped Collar This pullover is a soft, stretchy knit with a built-in crisp cotton collar in contrasting stripes. 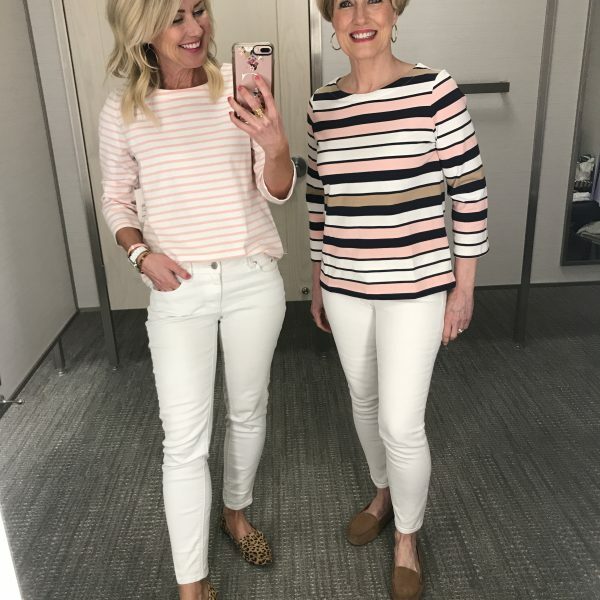 Preppy, lightweight, darling! I’m pairing it with white jeans and loafers for this trip. two // Fedora We had intermittent drizzle yesterday, and this hat came in handy! It’s a great fit, and the brim is the perfect width. three // Assorted Beach Art How gorgeous would this print be for our Guest Room? There are a series of them, and all at great prices. I’m envisioning one over the headboard of each bed. four // Tortoise Earrings I think of tortoise kind of like leopard’s cousin…it’s always chic, and goes with everything! These dangle earrings are surprisingly light, too. five // Cozy V-Neck Pullover I have this tunic in both gray and black, and they were one of my most-worn tops from last year. Long enough for leggings, but lightweight enough to half-tuck into your jeans. Plus, it feels like pajamas! 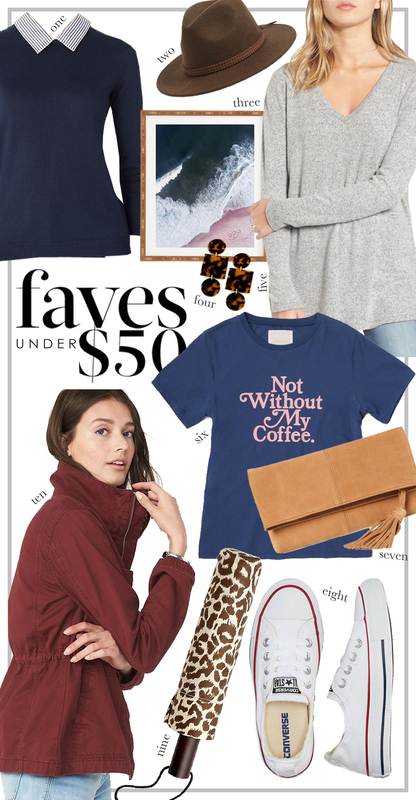 six // Graphic Tee Not without my coffee. Need I say more?! seven // Suede Clutch with Tassel Such a steal for this rich bag, tassel included! It comes in several neutrals and a punchy pink. eight // Slip-On Sneakers These Shoreline sneaks aren’t anything new, but needed to be included at this new, lower price. 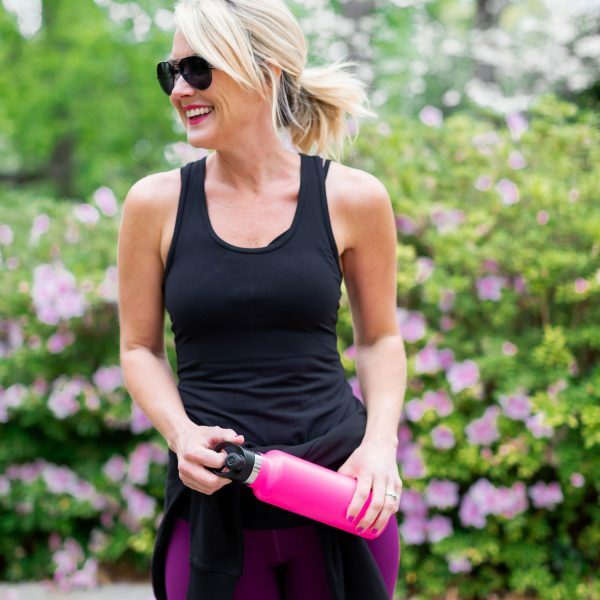 They’re my go-tos for travel…cute and comfy! nine // Leopard Umbrella Ireland and Scotland are on this itinerary, and known for rain…so of course I had to have a chic umbrella! Leopard it is! 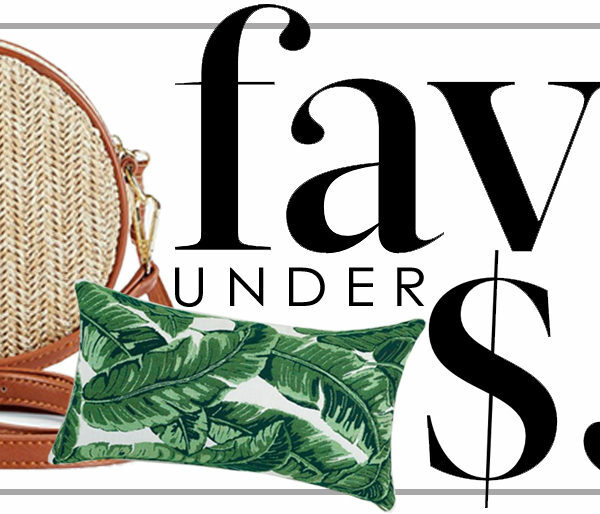 What’s your favorite from this round of Faves Under $50? 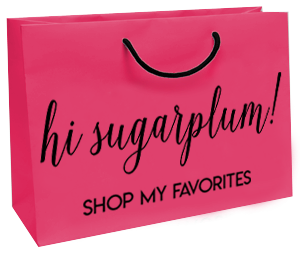 Have you spotted any great deals lately? Off to explore Cork, Ireland today…and tomorrow Dublin! Any can’t miss spots? Happy weekend, lovebugs! P.P.S…Are you following our cruising fun over on Instagram Stories? Backcountry // Up to 50% off Patagonia, etc! Kendra Scott // Buy more, save more, up to 25% off! This look from our trip has been a popular one, and many items are included in the sale! That clutch is soooooooooooooooo good!!!!! The Guernsey Literary and Potato Peel Pie Society was just made into a movie on Netflix too! So, if you are looking for a great movie and longing for the beautiful scenery….. The beach art will be perfect for your guest room! My favorites are the coffee T shirt and the leopard print umbrella. Have double fun in Dublin!! Do you have any ideas/tips to keep the Shoreline sneaks looking new? I shared that Twill Field jacker on my instastories this weekend. They are the best jackets and at that price, you could buy multiple colors!!! Love them! I love how that hat look! I also love the color of the Old Navy jacket you featured.